Adapter allows to mount the silencer to the sniper rifle S24 [P&J]. It have 14 mm counterclockwise thread. 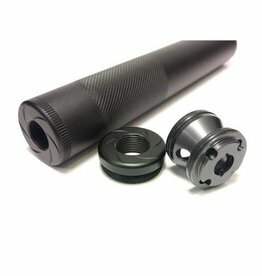 Smooth, compact aluminium 110x35mm dummy sound suppressor with a 14mm counterclockwise thread.Works great as an extension of the outer barrel to hide a longer inner barrel. Works great as an extension of the outer barrel to hide a longer inner barrel. For Airsoft use only. 14mm +/- thread direction. Adapter allows to mount the silencer to the sniper rifle CM.701, CM.702, CM.700. It have 14 mm counterclockwise thread. CYMA 155x30mm Dummy Sound Suppressor.